This photo is shot from the balcony of our hotel at 1200m in Les Rasses (Switzerland), which is ca. 150km away from the mountain on the day of our silver wedding anniversary. This is one of my favorite photos. I have shot it directly after waking up and "checking" the weather in the early morning. 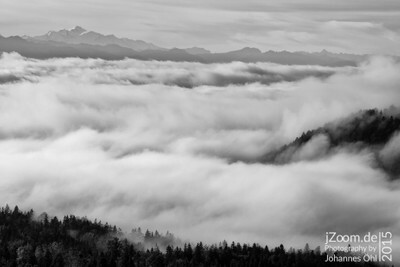 I was in September and the clouds in the valley where pushed against the mountain range where our hotel was. Half an our later, you couldn't see anything because of the dense fog. As a present of my wife I got a Sony ?7 II with a Vario-Tessar® T* FE 24–70 mm F4 ZA OSS. It's a great combination. I didn't use a tripod and of course no flash.? I was overwelmed by this view. I had to take this picture. There is no better inspiration than to see it directly. I used NIK silver efex to convert the photo into monochrome and increased the contrasts a little bit. Nothing much to do. What to say: The best shots are done in the morning or in the evening, because the weather at noon everybody nows. This photo lives with the cloud layers, which where there only in the early morning. The sight to the Mont Blanc was pure luck. Two days later, you couldn't see the alps at all.